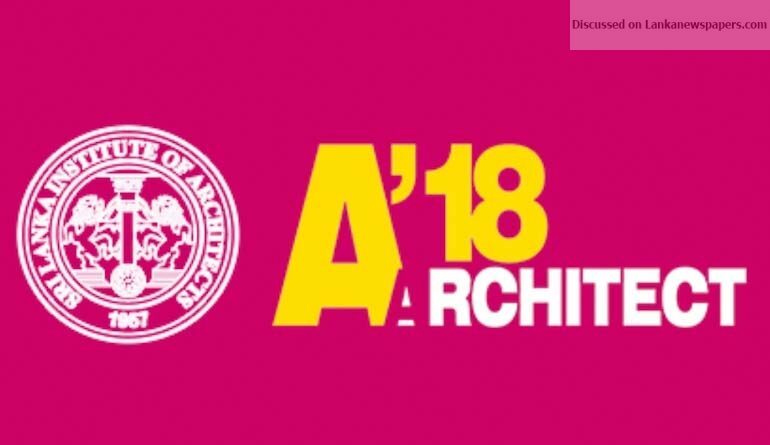 Sri Lanka Institute of Architects (SLIA) established in 1957 holds ‘A18 (ARCHITECT 2018)’ the pre-eminent and most popular trade exhibition in the country for the 36th consecutive time at the Bandaranaike Memorial International Conference Hall (BMICH) from the 22nd to 25th February. The Members’ Work and Trade Exhibition will be opened to the general public from 10.00 am to 10.00 pm providing the ultimate experience with more than 290 trade Stalls and 126 display including digital panels displaying architects’ work. The Inauguration Ceremony of the Annual Sessions of 2018 will be held on 21st February 2018, at 3.30pm and will be attended by President Maithreepala Sirisena as chief guest . The Minister of Megapolis and Western Development – Patali Champika Ranawaka will also be joining this occasion as the guest of honour. Members of the Sri Lanka Institute of Architects, members of other architectural Institutions in the region, foreign guests, special invitees and students from architecture field will also be present at the inauguration ceremony. This year’s National Conference will be held on 22nd February 2018 under the theme “Architecture to Represent People and Place”, will be inaugurated by the Minister of Housing & Construction Sajith Premadasa and Eran Wickramaratne, the State Minister of Finance. SLIA has invited Ar.Prof. Li Xiaodong (China) as the keynote speaker. Speakers such as Ar. Serina Hijjas from Malaysia and Ar. Jin Koyama of Singapore will also share their expertise knowledge and their experiences in the practice of architecture along with locally renowned architects such as Archt. Channa Daswatta and Archt. Phillip Weeraratne. A’18 – a shift from the norm – is a virtual e-exhibition, enabling the perception and awareness of the Public on the high quality, skills and capacity of the Sri Lankan Architects and the Building Industry. For the first time in Sri Lanka the Trade & the Architects are in one mutual electronic forum with their products and services easily accessible at this legendary Architects Exhibition that has evolved to its peak as SLIA celebrates the 60th Anniversary year. Visitors could explore, surf and locate services, materials and information of all products displayed via the internet and Mobile App. from the point of its conclusion. A’18 creates opportunities to introduce innovative new products, materials and services by suppliers. The effective use of these in projects by our own Members Work has further elevated the dynamic Digitally Projected Walkthroughs.